When my friend Inke fell in love with Peter she was so giddy that he commented, “I’ve planted butterflies in your stomach.” Little did they know at the time that a few years later those butterflies would turn into an adorable little baby! For Inke, Peter, and their daughter Luccia, the beach has always been a special place. Peter is a surfer and while he goes out and rides the swells of the Pacific Inke and Luccia play in the sand. Luccia is clearly growing up a beach baby and she is very comfortable running on the sand and playing in the shallow water. 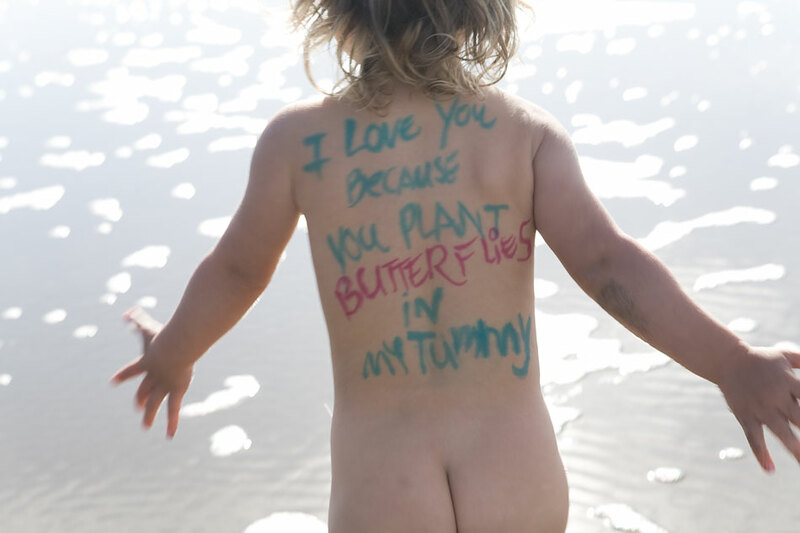 It was absolutely adorable following her with a camera down the beach with these words written on her back. She laughed and screamed with delight as I chased her and we certainly drew some attention. There is something beautiful and simple about this expression of love. When two people click there is a bodily sense of excitement. There is a line I like from a Mary Oliver poem: “You only have to let the soft animal of your body love what it loves.” Inke and Peter did just that and now they have Luccia!